Grigor Dimitrov saved a championship point on his way to winning a dramatic Queen's Club final against Feliciano Lopez. 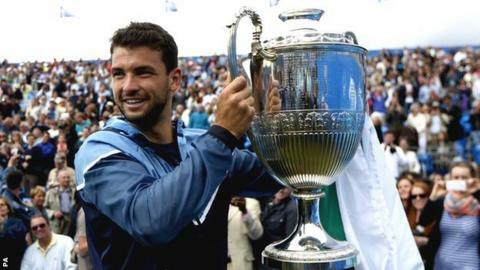 Bulgaria's Dimitrov, 23, seeded fourth, beat Lopez 6-7 (8-10) 7-6 (7-1) 7-6 (8-6) at the Aegon Championships. It is his fourth career title, and he is the first man this year to win titles on three different surfaces. "This tournament in particular has been the tournament I always wanted to win," said Dimitrov. "I remember playing as a teenager here, and ever since I have dreamt about that moment. "You can feel it in the spirit of the trophy itself. When you lift it, it means something. The only thing I can say is I'm going to be with a lot of positive vibes going to Wimbledon." Lopez, 32, went desperately close to landing the fourth title of his career and the 10th seed was a dejected figure afterwards. "The serving from both players was exceptional. Feliciano choked on that forehand at match point and he will be devastated by that, but Dimitrov has now won titles on hard, clay and grass courts this year and it shows what a complete player he is." He had his chance at match point in the second set tie-break, facing a second serve, but snatched at the return and hammered it into the net. The Spaniard had earlier saved two break points before edging the opening set in the tie-break, converting his fourth set point when Dimitrov slipped and netted a forehand. A similarly tight second set turned in a gripping 12th game that saw Dimitrov recover from 15-30, and then match point down, thanks to a raking backhand pass and a stunning volley along the way. Now in top gear, Dimitrov dropped just one point in the tie-break and moved 40-0 up in the opening game of the decider as he swept through 13 of 14 points - only to undo all his hard work. Allowed a way back into the game, Lopez did brilliantly to earn break point and thumped away a volley; having lost just two service games all week, he looked well set to close out the match. Dimitrov needed another burst of inspiration and he found it with some searing returns to create his first break point since the first set, and Lopez finally felt the pressure with a double-fault. A classic grass-court duel came down to a third tie-break and the chances remained fleeting, with the first rally coming at 4-4, but this time it was Dimitrov in the ascendancy. The Bulgarian matched his opponent by missing a match point when he framed a forehand high into the stands, but the former world junior number one clinched victory when Lopez could only find the net with a forehand. "I think when you face players like Grigor, you know that even playing the way I played today there is a chance to lose because he's a great player," said Lopez. "He never gives up, as he showed today." Earlier, Britain's Jamie Murray and Australian John Peers lost in the doubles final. They were beaten 4-6 7-6 (7-4) 10-4 by Brazil's Bruno Soares and Alexander Peya of Austria.